With his business in the doldrums, travel agent Grandpa Piuff (Sinoel) comes up with a cute gimmick. Why not book customers on a "surprise" voyage, with no set itinerary or destination? Vacationers are delighted with the notion, and before long a group of tourists and sightseers have embarked on a journey to goodness-knows-where. 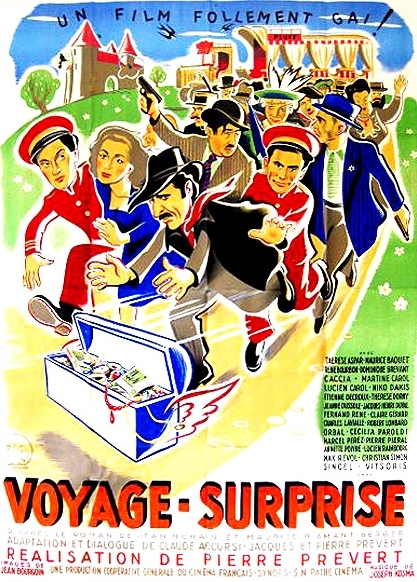 Their revelry is threatened by the wicked machinations of rival travel agent Grosbois (Rene Bourbon) and larcenous political insurrectionist Mikhail (Etienne Decroux). Nice transfer from what appears to be a 16mm print. Lovingly subtitled AND done the right way as optional. The subtitles miss a few snippets of dialogue, but nothing critical. The only thing better wd be a transfer from an archival 35mm print or the original neg. A superb job for a rarely seen film, not otherwise available. Transaction was easy, and delivery was super fast. The film was exactly as described and I'm very pleased. Thanks ! !